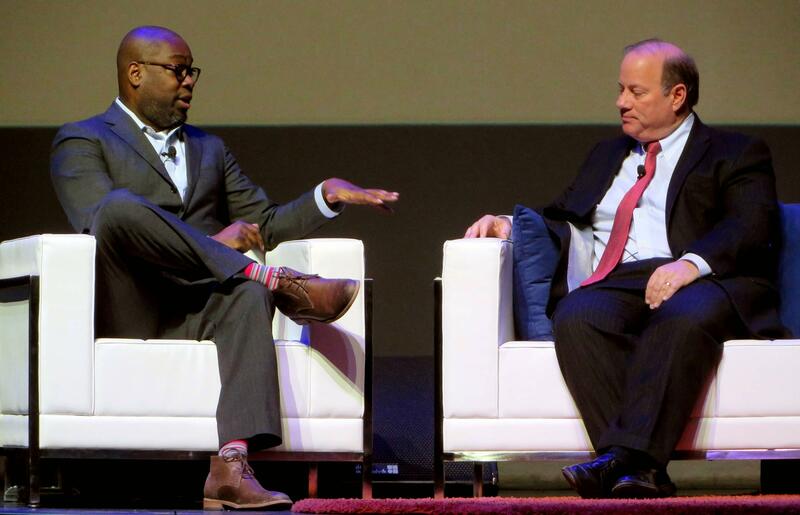 Detroit Mayor Mike Duggan (right) is interviewed by Stephen Henderson of the Free Press at the Detroit Regional Chamber Policy Conference on Thursday. At a meeting of business and civic leaders, Detroit Mayor Mike Duggan outlined a number of concerns and looming issues facing the city. 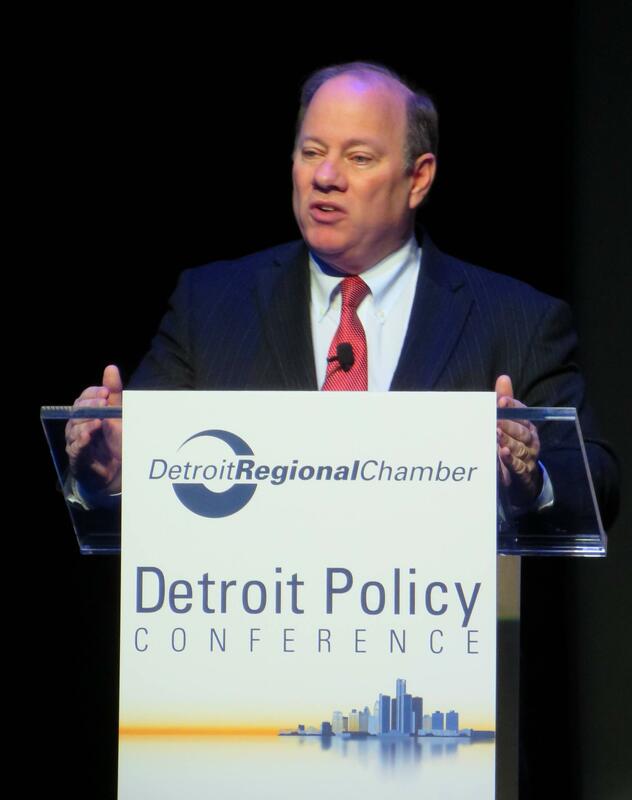 Following a speech at the Detroit Regional Chamber Policy Conference, Duggan was interviewed by Free Press Editorial Page Editor Stephen Henderson about challenges ahead. The mayor revealed Detroit will soon run out of money to tear down abandoned buildings. Duggan said there’s enough state and federal money to clean up blight for several more months, but after that it’s uncertain. “Right now, I don’t know where that money comes from after August,” Duggan admitted, although he said he was optimistic funds would be found. Duggan says he and Michigan’s U.S. Senators have been working with the Obama administration to find a new source of funds for blight removal. Of the $500 million the city needs to complete the job, it's received a total of $100 million. Last year four thousand abandoned houses were torn down and Duggan says he expects the same number will be demolished this year. When asked what he needed from state government, he said he’s not asking the state for more money. However he does want a new law to help the city collect its income tax from residents who work outside Detroit. “Just helping us collect the money we’re owed, nothing new," Duggan explained. Twenty-two cities in Michigan have an income tax. But, companies outside the cities are not required to withhold the city tax the way they’re required to withhold state and federal taxes. During the speech itself, Duggan noted the City of Detroit and its suburban neighbors are struggling with collaborative efforts. The mayor said attitudes have to change. "Away from us-versus-them and toward collaboration. We’re not going to attack people; we’re not going to criticize people; we’re going to pull people together,” Duggan told the audience. Macomb County Executive Mark Hackel says collaboration has to go better and be more open than regional water authority discussions which were gagged by a federal judge. "We’re here to have discussions, but I want these discussions to be open and very honest with the public, not just amongst elected officials in a backroom,” Hackel complained. Residents in the suburbs served by the Detroit Water and Sewerage Department face double-digit rate increases because of a new arrangement in the wake of the Detroit bankruptcy. The next big issue the region will tackle is mass transit.